Using Instagram can be a fantastic way to market your business. However, many business users can become discouraged by having a small audience and not knowing how to grow it. There are a number of ways you can do this, and we’re here to help you learn the ways of the Instagram force. Before we jump into the more advanced techniques, please bear this in mind: Use high-quality images and videos only. Don’t forget that. Ever. Instagram is all about uploading the best image that you can. Take, or find (it’s completely okay to use royalty-free images) high-quality images only – users won’t follow an account that doesn’t look pretty. Make sure you’re making the most of everything Instagram has to offer, too. 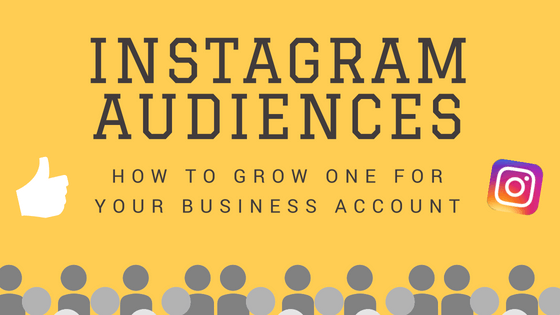 If you’re an active business in terms of uploading posts to the Instagram feed as well as creating engaging stories, you’re much more likely to attract new followers. As well as utilising all of Instagram’s features and having a portfolio of great pictures, or even a theme, there are some really effective ways to boost your number of followers. This might seem obvious, but it’s surprising how many people leave this super-powerful feature out of their Instagram strategy. Hashtags are a fantastic way to attract new followers to your business’s account. Deciding on the right hashtags to use for your business isn’t too hard. You are part of an industry, so use that to decide on your initial hashtags. 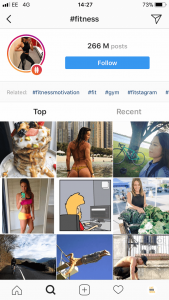 A fitness business might use “#fitness” as a broad hashtag for a post. At the time of writing, there are 266 million posts on Instagram using this hashtag. The post might feature “#coreworkout” as well – only 653 thousand posts. The trick is to find some broad and some specific hashtags to apply to each post in order to maximise the number of people who see each post. Spend some time testing which ones work best for you. Naturally, finding which ones work best will result in followers. Try to keep the hashtags slightly varied, too. Using the same ones in each post will have negative results. Don’t be afraid to include hashtags that aren’t directly related, too. 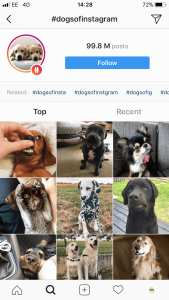 If there was a cute dog in the background, the fitness post might have used “#dogsofinstagram” as well, which is currently featured on 99 million posts. A fairly recent update has allowed users to follow specific hashtags, making them even more powerful. In our experience, we have found that posts which feature at least five hashtags seem to see better results than fewer hashtags. If you’re a small or medium-sized business, there’s a good chance that a high percentage of your business is locally based. 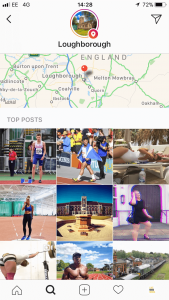 There are many people who use the locations feature on Instagram to discover new accounts to follow, as supporting local businesses is a passion for many. When you create a new post, remember to check into your local town, village or city, depending on how broad you want your reach to be. As well as that, attach a hashtag of your local area to your post, as some people find out what others in their area are posting this way. Finally, Instagram allows you to attach a location sticker to any stories you upload, which means your story post could feature on the official Instagram story for your area. Using influencers, or people who belong to a specific industry or topic with a lot of followers can be a fantastic way to grow a large, relative audience. A skincare brand might want to search for the biggest fashion or cosmetics influencers out there and visit their page. The followers (or in some cases fans) who comment on and like the influencer’s posts are almost guaranteed to be the perfect audience for the skincare brand. It is important to know that “mass-following” can result in account restrictions from Instagram, so following multiple accounts needs to be done in moderation. Another effective technique is to like comments and interact with users’ questions relating to your brand’s industry, adding credibility to your brand and getting your account’s name out there. Instagram has been part of the Facebook group for six years now. Facebook advertising is extremely powerful for a number of different objectives. Getting your brand’s content in front of people’s eyes who don’t follow your account for a small cost is a great way to attract new followers. Not only is advertising powerful with Facebook-related apps, but it’s relatively cheap as well. Try to get creative with your images and videos when you advertise on Instagram. Remember to look natural, too. You want you sponsored post to feel as though it is in your audience’s feed because they follow you. We hope some of these methods work for your business when trying to grow its Instagram following. Don’t forget to upgrade your account to a business account once you hit 100 followers – this unlocks the metrics section so you can track your best posts and more. If you’re looking for someone to help you out on your social media journey, check out how we can help you.